This entry was posted in Uncategorized on June 13, 2014 by 777mmm. The idea for the imagery for this moon card came during the dark of the moon (sometime during the darkest period of the lunar cycle, the three days preceding the new moon). I painted the colors during the full moon, and finished it today while the Moon is now waning again. 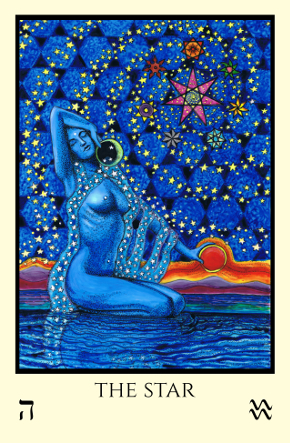 The Moon card while often depicted otherwise, to me is associated with the waning moon. As the trump of the sign of Pisces, the last sign, it personifies the waning energy of the end of a cycle. It’s letter is Qoph, meaning “back of the head”. This scan isn’t the greatest. I really need a new scanner. I have had this one for probably 15 years, I’m not sure but it has been so long I can’t remember exactly and it was the cheapest of the cheap. The glass has scratches and dings that show up in the scan. Why is it dinged and scratched, did I try to scan a rock?? I really love the colors in this card in the original, it glows with an otherworldly light. But this scan does not exactly replicate them. Too dark in some, too light in others, not the exact color. The sky in the original is the darkest color of blood. I hope to rescan all these someday. But here it is. Tell me what you see. What does the symbolism speak to you? Roll up the Excrement of the Earth, to create a Star! 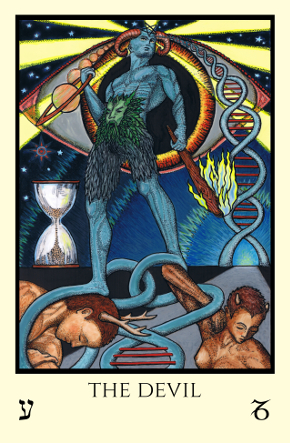 This entry was posted in New "Tarot M" in progress on December 19, 2013 by 777mmm. The Fool’s Dog, makers of the Rosetta Tarot apps for iPhone/iPad and for Android, have just let me know that they are offering a sale Black Friday though Cyber Monday, of 25% off of the app. The app is a great bargain because it includes the entire Book of Seshet as well as the deck! If you buy the app, please rate and review it; it really helps sales and helps others to know what to expect before purchasing. I am confident you will like it as they make great apps. Just thought I’d pass the news on to you all. And, to support getting that word out, I am extending the 25% off sale on the Pocket Rosetta decks through the same time period. Hope this helps combat winter doldrums! This entry was posted in Promotions and sales on November 29, 2013 by 777mmm. k sweet wines and wines that foam! Also, take your fill and will of love as ye will, when, where and with whom ye will! But always unto me. This entry was posted in New "Tarot M" in progress on November 16, 2013 by 777mmm. Day of the Dead, Rosetta anniversary special, ART! First I want to send Samhain wishes to you all, may it be a year filled with bright and beautiful things. Also, November 2nd is the 2 year anniverary of when the Rosetta Tarot was first published in 2011. Two whole years! I don’t remember if I did anything for the first year; maybe I just raised a toast at home. But for this year I’d like to share some abundance with you to celebrate, since it has been a great two years. So for those of you who celebrate the XMas/Solstice season tradition of small, meaningful gifts, this could be just the thing. A $20 gift that fits into a pocket or a stocking. And they still come with a customized significator, so if buying for someone else, please let me know what name to put on the card (first name only as the pocket size cards are smaller). Next bit of good news: The Fool’s Dog, who published an app of the Rosetta Tarot and the complete Book of Seshet on iPhone and iPad, are soon to release a version on Android! Since many of you Android peeps asked about that I will let you know when it is available. Last is some fun art I promised in the last newsletter to share. The submission for the 3D art project I participated in for Mystery Build has been posted on their website. The challenge was that you must purchase a kit with a random selection of materials in it. Everyone gets the same kit, but you do not know what will be in it until you get it. Then you had to reINVENT (not just recreate) a famous work of art using only the materials in the kit; nothing else except for paint or coloring media. When you go to the site, the entries are in random order. Mine is #18 and is called “The Reintegration of the Disintegration of the Persistance of Memory” (quite a mouthful) and is a recreation of Salvadore Dali’s “Disintegration of the Persistance of Memory” which was HIS reinvention of his own earlier, more famous work “The Persistance of Memory“. When you go to the page you can click on the title of the work to read my description of the concept of my reinvention and how I used the random materials to build it. Yes, you can vote if you want! Only once per day per IP address though through Nov 20th. There is a generous “people’s choice” prize. Which I do not expect to win but hey it is worth putting it out there. Making this thing took 3 months. Mostly because I had to hand saw all those little wooden blocks from a tiny block of walnut (super hard) wood with an Xacto hobby hand saw. (yeah, major blisters were involved, but it toughened my hands up for cracking hickory nuts later in the fall) It was a fun challenge! This entry was posted in Promotions and sales on November 2, 2013 by 777mmm. Hello, I am still here. Are you surprised? First a brief mention that I recently received back about 20 Rosetta decks that someone was holding for me. These are numbered in the mid 500 range, while currently the first edition of 777 is selling in the mid 600 range. So if anyone wants an earlier number or has a number five fetish, these are now available. I fully realize that it has been quite long since I sent anything out to you. 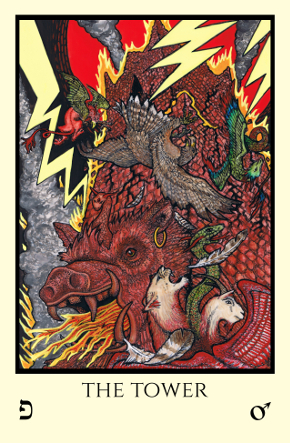 I got really sidetracked over the summer and stopped working on this tarot for several months. First I got all obsessed with doing this 3D sculpture for a contest called Mystery Build, where you get a box of random stuff and had to recreate a famous work of art using nothing but that. (If you are wondering, I did Dali’s “The Disintegration of the Persistance of Memory“). It took like three months as it involved hand cutting a small block of extremely hard walnut wood into like a hundred tiny rectangles with a hobby sized Xacto hand saw and miter box and then sanding them all, among other challenging things. If you are interested, I will share the site with the pictures in November as I think that is when the contest entries are posted for public viewing. After that got done it was garden harvest time, and time to can and freeze stuff and go nutting . Yes, nutting! And on the Devil’s Nutting Day and several Sundays too I might add though he did not appear, directly at least. (I now try to say “as black as the Devil’s Nutting Bag” as often as possible in conversation though.) Then it was time for going shroom hunting and making beer and mead and all that food and drink preservation stuff so more time lapsed. Total obsession with hickory nuts and how best to crack them and what to do with them then ensued for a stretch, and continues, as I gathered gallons of them. Another few months pass. And I got really seriously into a phase of making homemade bitters and, um, using them too in classic prohibition era drinks. I even am attempting to make the hickories into nut liquor. (Haha, “Nut Liquor”, said the bishop to the actress.) I tend to get obsessed with one thing after another it seems. If only there was more time in a day. Or better yet, fewer necessary day job hours! Then it was time to get back to it as I missed Tarot M and intend to obsess about that instead for awhile and so I started back in and right off I got totally stuck. Momentum lost, artist blocked, locked up, imprisoned. The paper for the Tower mocked me from the table top for days, maybe weeks. I drew and redrew until the paper was grey with graphite smudges and still it was not what I felt was the Tower I saw inside. Got new paper ready. Finally, the lightning flashes. Of course, the breakthrough came on the day of the October full moon lunar eclipse in Aries. Since the Tower is the trump of Mars (which rules Aries) and a full moon eclipse is also a culmination or ending, it felt right. One door closes and another opens and all that. I always marvel that there seems to be an astrological event that brings the cards through, especially when I get stuck for a while. Now I knew about the Jaws of Dis from the Thoth, but this mouth door with winged demons flying around it otherwise came from my own head. Or so I thought. Anyway I got chills. What memory or thing just came through this eclipse portal? This entry was posted in New "Tarot M" in progress on October 28, 2013 by 777mmm. Devil’s got a lotta names…GD title is Lord of the Gates of Matter, Child of the Forces of Time. He controls the gateway of the material world. Some call him Lucifer, Son of the Morning. Others, Pan Pangenetor, the All-Begetter, or maybe you call him Priapus, Set, Satan, Baphomet, or Ba ‘Neb’ Djedu. 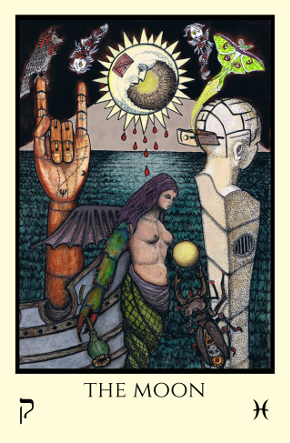 This entry was posted in New "Tarot M" in progress on June 10, 2013 by 777mmm.